Scientific Name(s): Tectaria moorei (Hook.) C. Chr. 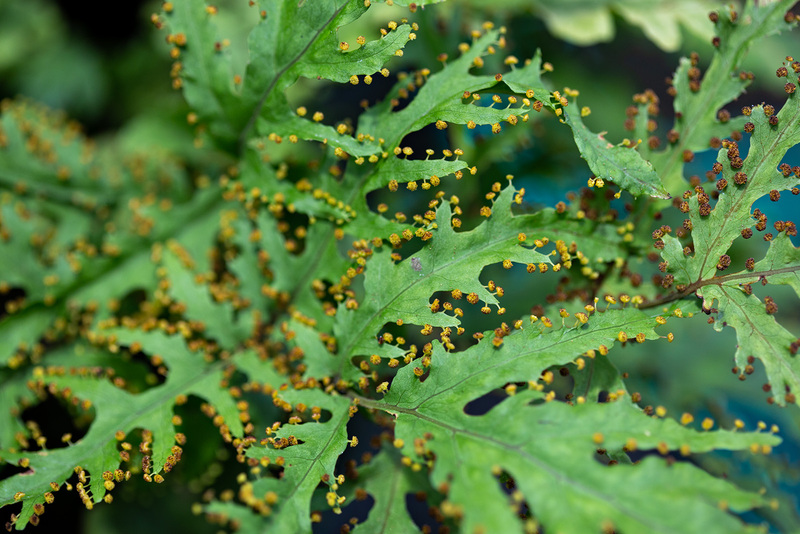 Usually, ferns have their spore-bearing structures (or sori) on the surface of the frond or lamina (e.g., Polypodium glycyrrhiza). Sometimes, as in Adiantum shastense (see image in comments), the sori are marginal or on the edge of the frond. A third scenario is presented today: stalked marginal sori that extend from the tips of the veinlets. The Tectariaceae contains 7 genera and 250 or so species, with Tectaria being the largest representative (ca. 200 species). The family is pantropical; only a few representatives can be found in temperate regions. Tectaria moorei is endemic to the botanical wonderland of New Caledonia; this small archipelago is also the home of the world’s largest living fern (Cyathea intermedia) and the world’s only known parasitic gymnosperm (Parasitaxus usta). To explore the unique (and we never use that word lightly on BPotD) flora and fauna of New Caledonia, visit Endemia – the Flora and Fauna of New Caledonia. Along with Tectaria moorei (additional photographs! ), they feature over 3000 endemics in this region of < 19 000 km2. To put that in perspective for local readers, that would be the equivalent of 6 species found nowhere else in the world within the city limits of Vancouver. Wonderful writing, as usual; and a very clear picture of the stalks. I was so surprised to see a photo of a plant endemic to New Caledonia, as I had just earlier today found the https://newcaledoniaplants.com/ website, sponsored by the Atlanta Botanical Garden, one of the partners of Endemia. The website does not feature this plant, but it does have a useful overview of the ecology and biodiversity of these islands. I have to say this is one of the most fascinating posts I can remember. Who’d have thought that that miniscule blot on the globe would prove to be so utterly enchanting. Lucky Atlanta. As always, thank you! What a delight! Ferns are the BEST! Thank you, Daniel, for opening so many mental doors for me. Pat said it – ferns are the best! And you never know what’s next in the plant world. Thank you. Surely at some point I will know of all the weird plants the Earth has produced. Not today, though. What a gorgeous fern!! Its architectural qualities are stunning. Thank you for the beautiful photo, as always!